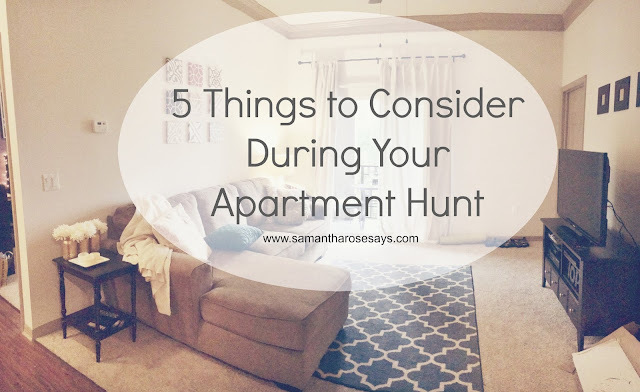 It's my favorite time of year again - apartment hunting time! Am I the only one who gets super pumped about looking for a new place to call home? If the real estate industry wasn't as unbearably saturated as it is (especially in Tampa), I probably would have considered it as a career path. But I digress - I just love apartment hunting! It's been just over a year since I moved out of my parents house and into my first big-girl/non-student living apartment, and our time in said apartment will be coming to an end in early September. After careful thought and consideration, Ryan and I both feel ready to take the leap and move in together once my lease is up, so the last few weeks we started looking about our area of interest with real intent. I don't really consider myself to be "Type A," but there's nothing I love more than a good list. As soon as we started getting serious about our search, I compiled a list of the complexes I want to visit into a color-coded Excel spreadsheet, complete with square footage, pricing, and pet deposit fees. Because if I don't, who will? one | Pricing. For most people, rent is a major component when it comes to selecting a place to live. Typically, you should spend no more than 30% of your take-home income on rent. Keep in mind, "rent" in this case actually means the total cost of rent, utilities, insurance, etc. So if you take home $40,000 a year, you should aim to spend $1,000 per month on rent and all of your utilities. Basically, have a price range in mind and stick to it. two | Amenities. This could actually help you out in the pricing department. Does your potential apartment have a fitness center in the club house? Cancel your $30 per month gym membership and use your apartment's gym for free. One of the apartments Ryan and I were looking at had an iPad linked to a big screen TV with 50+ work out videos and necessary equipment. It was like having a computerized personal trainer. three | Fees. I'm guilty of forgetting about new move-in fees when it comes to a fresh apartment. It could vary depending on where you live, but I know for us it'll cost about $250 just to turn on electric. Pet fees will throw you for a loop, too. Some apartments allow "deposits," aka where you get your money back at the end of your lease, but many require a fee, meaning a flat rate that you don't get back...ever. Bye bye, $400. Not to mention application fees, first and last month's rent up front, etc. Also important to ask: what's included in your rent? Water? Trash? Basic cable? four | Safety. If the complex isn't gated, that's a deal breaker for me, but it might be different for you. As a woman (or just as a human being in general), feeling comfortable enough to walk my dog outside alone at night is a huge factor. If finding a place in a decent neighborhood means sticking to the top end of my budget, then so be it! five | Parking. This is especially important if you're looking into renting a condo or town home. Many residences like these provide only one guest parking spot per tenant. No thank you! It wouldn't be a bad idea to ask about night time parking conditions, either. And again, this could fall into the safety category. If the closest/most convenient parking spots are going to be taken come 9 p.m., you should feel comfortable enough to walk across the complex without a safety concern. If all goes according to plan, we should be signing a lease by the end of this week! So exciting. Do you have any deal breakers when it comes to looking for a new place to live? What in particular do you look for? Let me know in the comments!